Submitted by jan.svec on 15. October 2008 - 15:34. We added support for German GMail - this GMail is not called GMail, it is called Google Mail. Users of German Google Mail can now do backups of their accounts using GMail Backup. We tried to fix the UnicodeError reported here. Is there somebody using the non-ASCII labels who can test it and report the results? This version is only a small bugfix release, so if you don't observe any problems you don't have to upgrade. #1Submitted by iosonofabio (not verified) on 16. October 2008 - 12:54. It looks like working now. I tried other solutions before, like Thunderbird or other POP clients, but I always go errors at some point. On the contrary, this seems to work. Good job! #2Submitted by iosonofabio (not verified) on 16. October 2008 - 15:03. I'm using this version under Linux Ubuntu 8.04 (32 bit). It works very well... compliments! #3Submitted by Iuri Fanti (not verified) on 3. November 2008 - 11:44. Why not to add support for marking deleted emails, e.g. by moving them into a "deleted" directory? Supposing a use case in which backupped emails could be browsed, another useful and very easy to make tool for gmail backup could be a simple html doc creator for one short report of all .eml files: id-subject mapping, attachments names, etc. #4Submitted by Dan Rochman (not verified) on 3. November 2008 - 21:42. #5Submitted by Anonymous (not verified) on 4. November 2008 - 5:24. Does this work with mac too? #6Submitted by Xyala (not verified) on 4. November 2008 - 5:38. Hi, i'm on mac OSX and i would like to know if you will produce a version of this software for the mac users. #7Submitted by Anonymous (not verified) on 4. November 2008 - 17:05. Another vote for OSX !! #8Submitted by Anonymous (not verified) on 4. November 2008 - 17:36. #9Submitted by Josh of Cubicle Ninjas (not verified) on 4. November 2008 - 18:58. #10Submitted by jim c (not verified) on 4. November 2008 - 23:38.
mac os x please + 1 ! #11Submitted by Radicke (not verified) on 5. November 2008 - 10:14.
why not pop backup to outlook? I don´t see the advantage here - why not Pop the gmails into my normal outlook on a regular basis and save them as a normal .pst file? #12Submitted by shaice (not verified) on 5. November 2008 - 12:17.
but no luck for me. The program crashes without any clue. 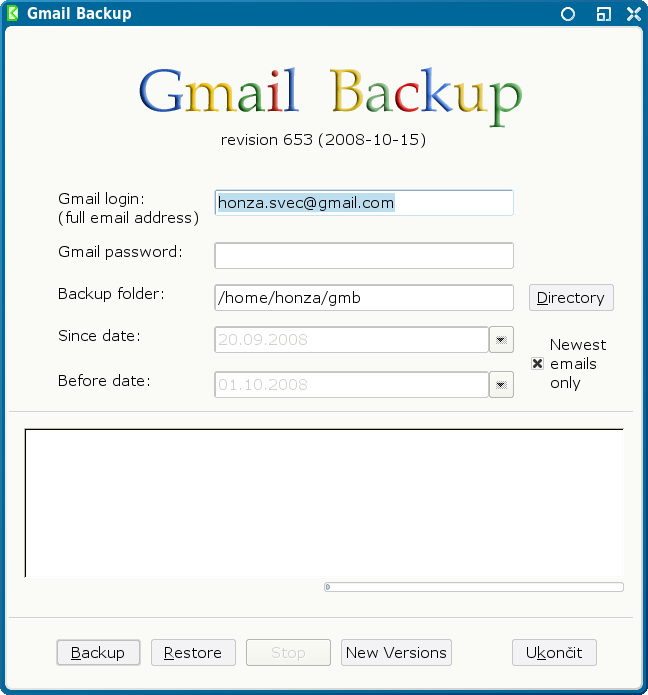 I read about an unofficial version of gmail backup without GUI. Could you please send me to the right direction? #13Submitted by shaice (not verified) on 5. November 2008 - 12:33. Mac OSX CLI runs well! Dear all, with the CLI interface (with all the correct parameters, otherwise it will return the 'No gmb' error) all runs well. and all seems to go well! Python interface crashes after 1 sec. latest python and wxpython installed. #14Submitted by john (not verified) on 16. November 2008 - 6:03.
thanks! your instructions made the difference. the backup is running right now -- though slowly -- on my up-to-date leopard system 10.5.5 on my macbook. #15Submitted by Anonymous on 15. February 2011 - 16:07. What the heck is CLI? I guess I missed that somewhere, but would like to get it running even if from the command line. Thanks for your post; I hope to see a response! #16Submitted by vijay singh (not verified) on 5. November 2008 - 13:01. #17Submitted by Techie (not verified) on 5. November 2008 - 22:53. #18Submitted by Anonymous on 28. June 2010 - 12:46. #19Submitted by Anonymous on 23. March 2010 - 10:12. But the network works well. Anybody can help me? #20Submitted by Robert Andrews (not verified) on 5. November 2008 - 23:36. Can I download all my Gmail.com email and then restore it back to my GAFYD Gmail account? #21Submitted by filip.jurcicek on 6. November 2008 - 1:08. #22Submitted by Anonymous (not verified) on 6. November 2008 - 13:11. #23Submitted by Anonymous (not verified) on 7. November 2008 - 3:50. How to use under firewall ? #24Submitted by Joel Odom (not verified) on 8. November 2008 - 1:31. I've been using this product for a couple of days now to back up two accounts. It's working great. One issue I've noticed is that Gmail apparently throttles the maximum number of IMAP requests you can make in a limited period of time, so I have to do the back up incrementally. Other than that, it's working great! #25Submitted by Joel Odom (not verified) on 8. November 2008 - 1:43. I've been using this on Windows XP and Vista, and it's working on both. No problems so far moving backup folders between two PCs using a flash drive. The issue of getting disconnected partway into the backup process is annoying, but I think this is due to an access limit imposed by Google. It would be nice to have a feature where it would retrieve a certain segment of the backup every few hours or so instead of trying to do it all at once and failing. #26Submitted by IALZA (not verified) on 8. November 2008 - 7:32.
sl2 and great job. Thanks a lot. #27Submitted by IALZA (not verified) on 8. November 2008 - 7:57. Another detail... the interface to Win XP cannot be minimized. #28Submitted by Carmelo (not verified) on 8. November 2008 - 18:14. Does a Mac version exists? #29Submitted by togrpe (not verified) on 10. November 2008 - 15:34. #30Submitted by Anonymous (not verified) on 15. November 2008 - 13:29. #31Submitted by Ouriel (not verified) on 16. November 2008 - 16:55.
for those wanting an OSX backup just use the mail.app with IMAP set up. you ll have a full back up of your emails + contacts. #32Submitted by Anonymous on 10. June 2010 - 18:39. Hi .. I saw your post .. is there somewhere that can walk me thru the back up process. I don't use my mail.com .. but have it .. what is IMAP? #33Submitted by Anonymous (not verified) on 17. November 2008 - 8:03. I feel good with gmail backup, i tried pop peepr and it is better. #34Submitted by Jim (not verified) on 18. November 2008 - 22:12.
backup the outbox? and eml-filenaming? 1. I'd like to backup my outbox/sent messages as well. Can it be added? #35Submitted by Job (not verified) on 21. November 2008 - 18:10. Didn't know this kinda software exsisted. Are you planning on making it open source? If so, i'm a willing developer. #36Submitted by Robert (not verified) on 21. November 2008 - 18:19. I backed up one gmail account. It appears from the number of files that the correct number of .eml files were created but the labels.txt file only includes entries for emails that were located in the inbox (i.e., if a take the number of .eml files minus the lines in the labels.txt file, I'm off by the number of messages that were in my sent folder of this account). When I restored this backup to another account, only the inbox files were restored. Do you know about this? Do you have a way of backup up and restoring a particular folder inside gmail so I can get these other files moved over? TIA. BTW, nice tool! #37Submitted by Ruslan Samchuk (not verified) on 2. December 2008 - 23:50. #38Submitted by Harihara Murugan (not verified) on 9. December 2008 - 13:14. #39Submitted by Lau (not verified) on 12. December 2008 - 23:56. I keep reading all the posts saying that it works with leapord... but I can't get it to work! I downloaded python and i dont know what i'm missing. someone please help me!!!! #40Submitted by Anonymous on 23. September 2009 - 2:24. I believe this is very important to all of us. I will bookmark it now! #41Submitted by I use it everyday ffor the backup (not verified) on 28. December 2008 - 22:52. The Chat backup is as important as all the email please, thank you. #42Submitted by Anonymous (not verified) on 30. December 2008 - 22:07. #43Submitted by Anonymous (not verified) on 30. December 2008 - 23:04. #44Submitted by Be-Mike (not verified) on 16. March 2009 - 0:13. "Error:(10060, 'Operation timed out')" everytime I try to create a backup. #45Submitted by Jos Veraert (not verified) on 23. March 2009 - 15:55. Please give me an solution. Thanks. #46Submitted by Anonymous on 26. January 2010 - 15:10. #47Submitted by Anonymous on 5. March 2010 - 19:01. I just got a Time Capsule for my mac, and have been wondering how to back up my gmail. The problem with simply using IMAP for backup is that it the local IMAP mail is meant to be a mirror image of what is on gmail. So if something goes wrong with my gmail mail, the same thing would happen to the local backup. But I think Time Machine solves this, as you can simply go back to your local mail folders as they were before the disaster.. So the combination of IMAP with a local client like Thunderbird, and Time Machine, should really be a solid backup of all my gmail. Or? #48Submitted by Anonymous on 8. March 2010 - 19:27. Gmail backup with IMAP / Time Machine seems to work. I just quit mail.app, went offline, removed the Mail folder from Library, restored the Mail folder from a Time Machine backup to the Library, and turned mail.app on again. Everything in place. It is important to copy/move the whole Mail folder, not bits and pieces of it, since a lot of what is inside it is interconnected.. Also, since it is possible to mark and move several folder at once inside mail.app, to/from local folders/imap folders either way. Restoring my gmail after a disaster seems a piece of cake..
#49Submitted by Anonymous on 11. August 2010 - 6:46. #50Submitted by Anonymous on 14. August 2010 - 3:36.
is it backup for both inbox & sent box of my gmail account ? #51Submitted by Anonymous on 23. August 2010 - 11:03.
how do i upload into the new account?? I'm a techno-idiot here. Downloaded Gmail backup, got all my mail backed up....but how do i upload it onto my new gmail account? thanks. #52Submitted by Anonymous on 10. September 2010 - 11:03. I had a computer trashed out so bad I rebuilt it from scratch with the vendor supplied CD. After getting everything set up, I tried to download Gmail backup, I get a "403 error, access denied" (I think that is coming from Forefox). How do I get Firefox to allow the download? #53Submitted by Anonymous on 24. October 2010 - 2:21. Hello! cdedefg interesting cdedefg site! #54Submitted by Anonymous on 11. November 2010 - 14:55. How to seperate inbox and sent mail back upped .. is there a way that i can select only inbox or only sent mails..
#55Submitted by Anonymous on 26. November 2010 - 17:56. Hello! cdkccdd interesting cdkccdd site! #56Submitted by Anonymous on 10. December 2010 - 14:40. Hello! acadfbd interesting acadfbd site! #57Submitted by Anonymous on 19. December 2010 - 6:56.